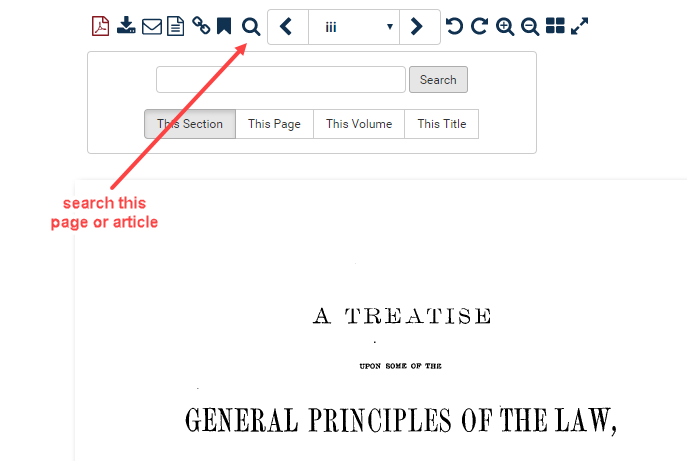 How do I search a specific volume of a title in the Legal Classics or World Trials? In the Legal Classics and World Trials libraries, you may come across titles that have multiple volumes. Some sets are more extensive than others, but in any case, you may want to search only a volume or two rather than search across the entire set. 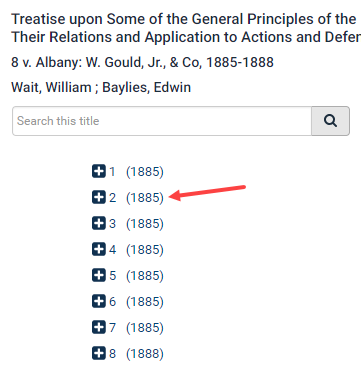 For example, we want to find references to fraud in the 7 volume set of “Treatise upon Some of the General Principles of the Law, Whether of a Legal, or of an Equitable Nature, including their Relations and Application to Actions and Defenses in General” written by William Wait. To search by volume number, you must construct your search using the Advanced Search option. To search by volume number, begin by entering the Legal Classics database. Find the title you are looking for using the alphabetic listing. Scroll down to find the title or CTRL F to type the title and it will be highlighted for you. Find volume 2 and open it up. Click on the magnifying glass above the page image. Next click on “This Volume” and enter fraud into the search box. Then hit the search button.